Each year, the winter months bring special challenges for American workers and workplaces. Plummeting temperatures increase the risk of cold-related injuries for the millions who spend part or all of their workdays outside. Winter also brings an uptick in seasonal illnesses that can impact Americans in virtually all work environments. OSHA places “cold stress” at the top of its list of dangers that arise in the course of winter work. Cold stress is an umbrella term which includes hypothermia, frostbite, and trench foot. Risk factors for these conditions include dressing improperly, having wet clothing or skin, and physical exhaustion. In addition to cold-related injuries, illness also spikes in the winter months. According to the CDC, the flu season costs American workplaces $10.5 billion annually in medical costs and lost worker productivity. The National Library of Medicine estimates that between 5 percent and 20 percent of Americans get the flu each year, and many more will come down with debilitating coughs and colds. Influenza vaccination can be especially important for older workers; about 90% of flu-related fatalities occur in Americans age 65 and older. If possible, the CDC recommends employers consider hosting a flu vaccination clinic in their place of business, or even partnering with local healthcare providers or pharmacies to get employees vaccinated. 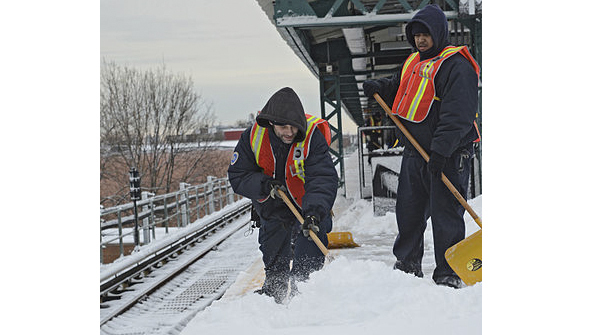 So, do you or your employees need to brush up on winter workplace safety? MSDSonline’s library of on-demand workplace training modules can help. “Working in Extreme Temperatures” provides training on how to identify and avoid hazards related to working in conditions with extreme temperatures. It helps learners become familiar with symptoms of cold (and heat) related illnesses, factors that affect the body’s ability to withstand extreme temperatures, and first aid measures that may be needed for temperature-related conditions. The course also provides a review of PPE precautions for extreme environments. For more information on OSHA’s preparedness suggestions for keeping workers healthy and safe this winter, you can visit their winter weather website. To learn more about how MSDSonline’s suite of on-demand trainings can help with winter weather safety in your workplace, visit our online course library.